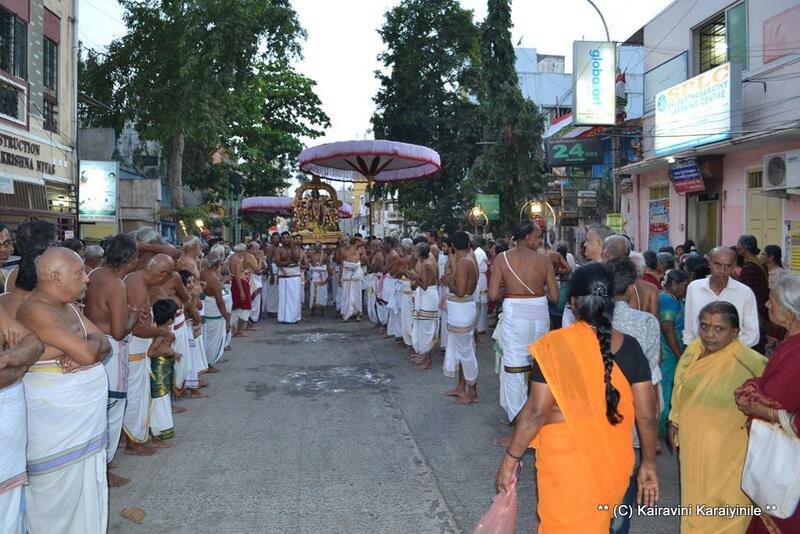 Thavana Uthsavam is now on at Thiruvallikkeni and today is day 3 – the concluding day of the Uthsavam for Sri Azhagiya Singar. 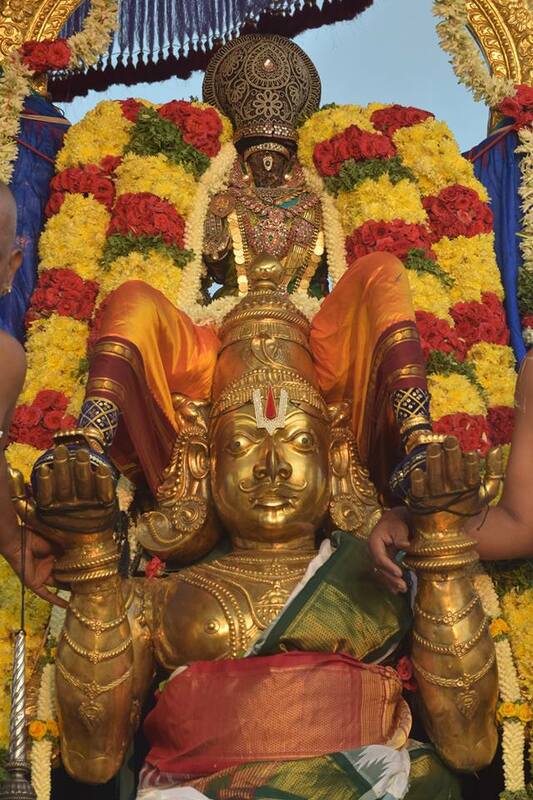 In this divyadesam, Lord Narasimha is in Yogic posture as Yoga Narasimha and the Uthsavar is the most beautiful Thelliya Singar, who is all grace. 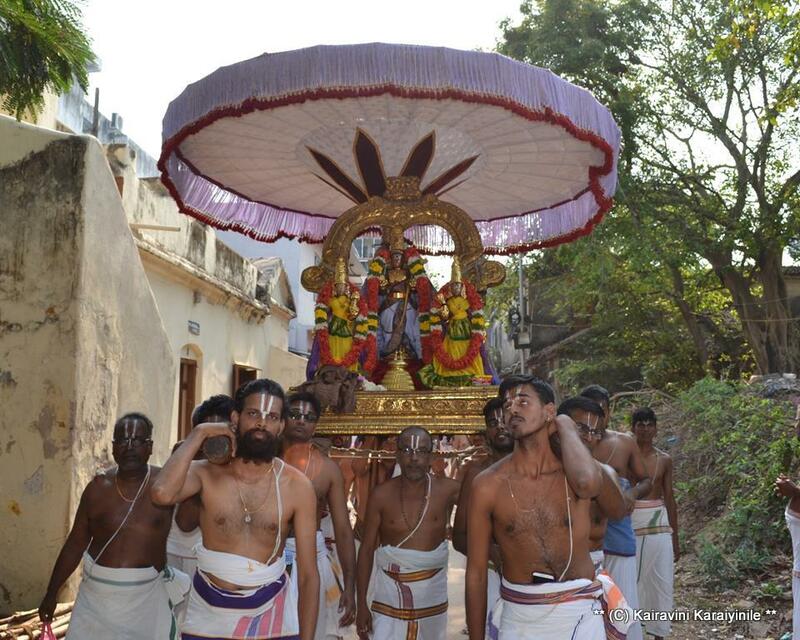 This morning, we had the fortune of having His darshan as He came in procession to Thavana Uthsava bungalow. 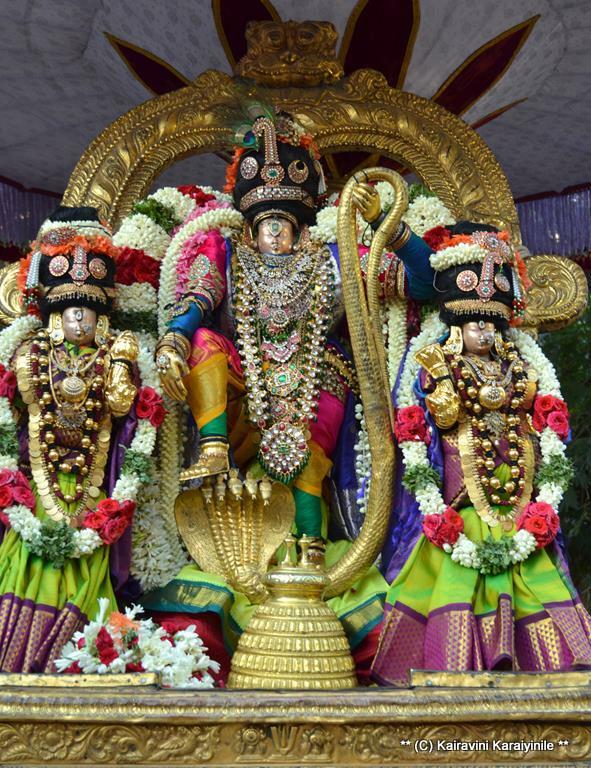 For us Lord Sriman Narayana manifests in many forms – He is simple, makes Himself available to us – we cry Gopala – it means ‘the one who tends to cow’. Divinity can easily be seen in great ascetics, Kings, and many other ways – our Lord is seen as cowherd too. In Gokul, as He grew the cows were so happy. 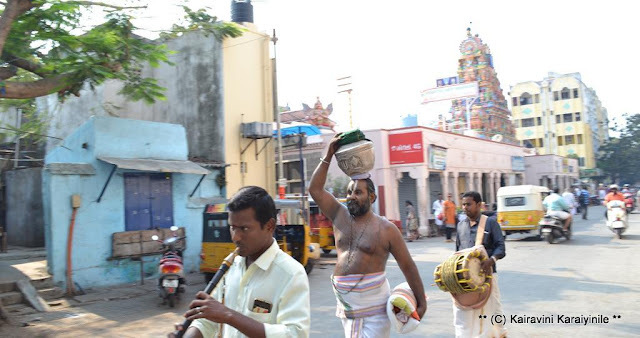 He is the master of the Universe and of all arts – He is Venugopalan – one who enchants people with his flute. 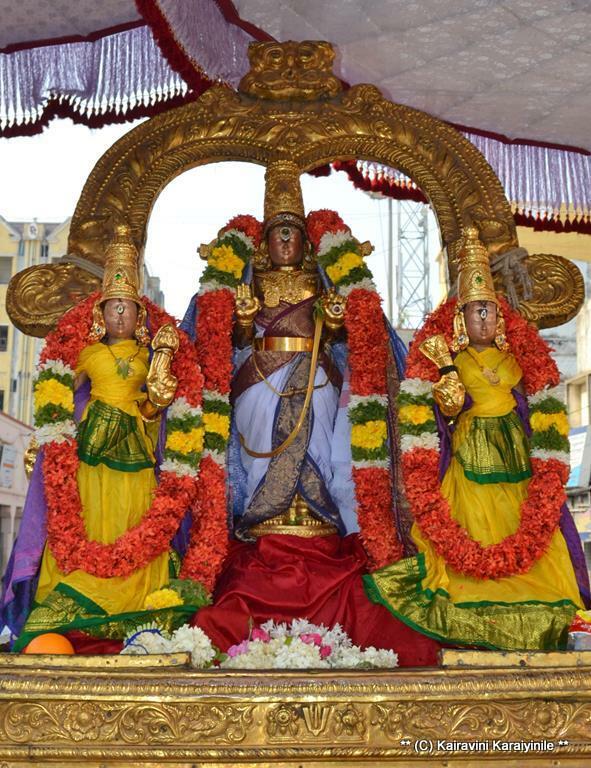 Blessed are we, as Lord Azhagiya Singa as Sri Venugopala came to us and that blemishless hue of His has enchanted us and swept us to His divine feet. 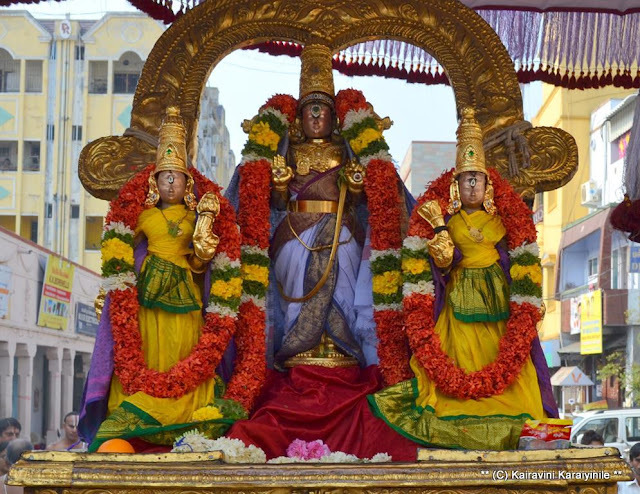 Here are some photos of Sri Venugopala thirukolam of Sri Azhagiya singar at Thiruvallikkeni on day 3 evening of Thavana Uthsavam today. 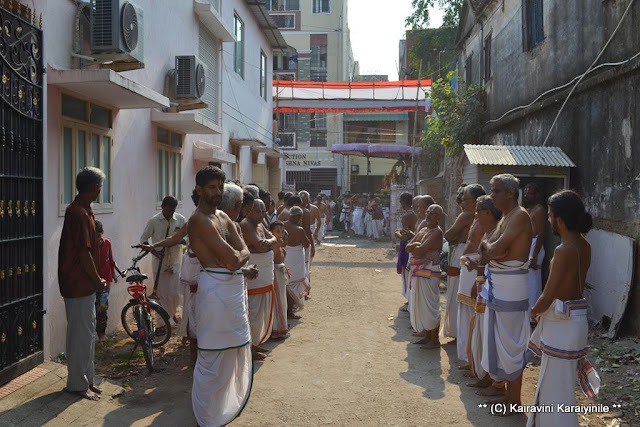 In what could be the shortest of the purappadu – one gets the greatest opportunity of worshipping Him in close quarters. Today is day 3 of Thavana Uthsavam for Sri Azhagiya Singar – in the morning, Thelliya Singar has purappadu from His sannathi to Thavana Uthsava bungalow which could hardly be 50 mtrs or so. 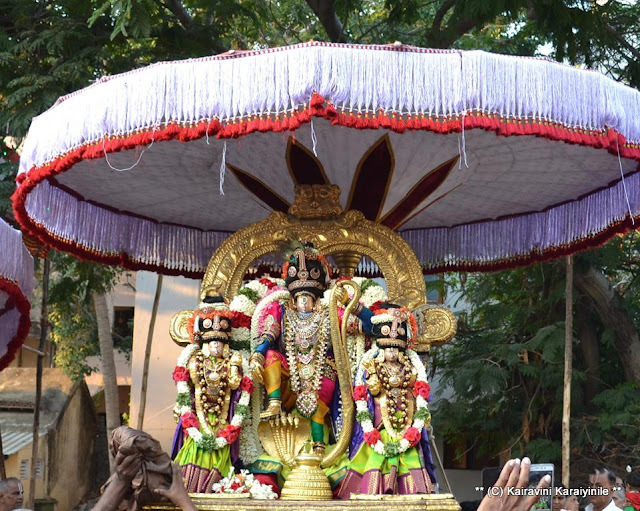 In this purappadu, a single garland adorns Him. 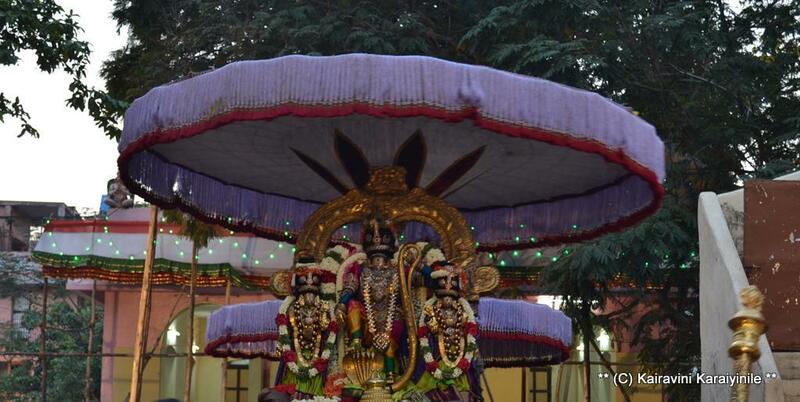 At Thavana Uthsava bungalow, Perumal has thirumanjanam and thence rest. With the onset of summer, Perumal takes rest under the roof made of dhavanam (Tamil: தவனம்) [Artemisia pallens] – an aromatic herb. In the evening there will be purappadu inside the bungalow and thereafter periyamada veethi purappadu back to the sannathi. 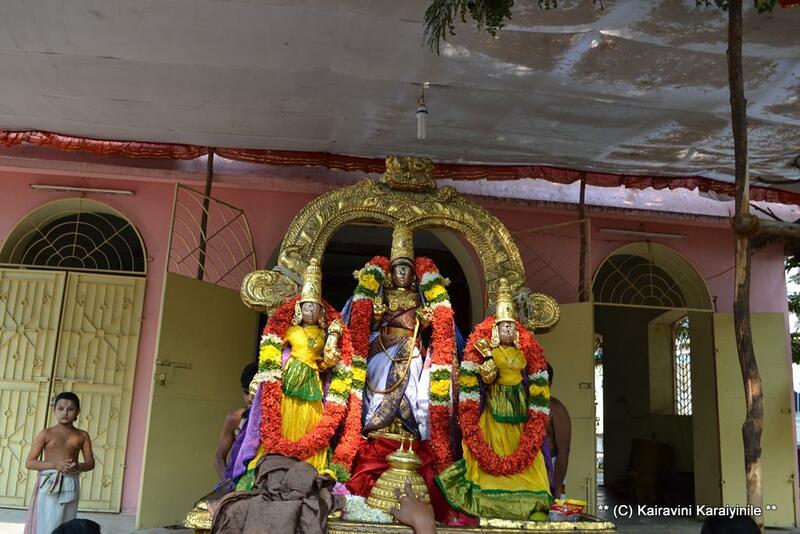 kainkaryabarar Sri NGK mama and Thirumanjana kudam below.. ..
Muthalazhwaargal were naturally extolled at the golden feet of Emperumaan. Sri Peyalwaar hails Him thus : the golden feet that strode the Earth are of the hue of lotus. His body is the hue of the ocean. His crown is the radiance of the sun. His effulgent discus too is like the sun, Is he not beautiful beyond compare? முதலாழ்வார்கள் உலகளந்த சரிதையிலே மிகவும் ஆழ்ந்திருப்பர்களென்பது ப்ரஸித்தம். 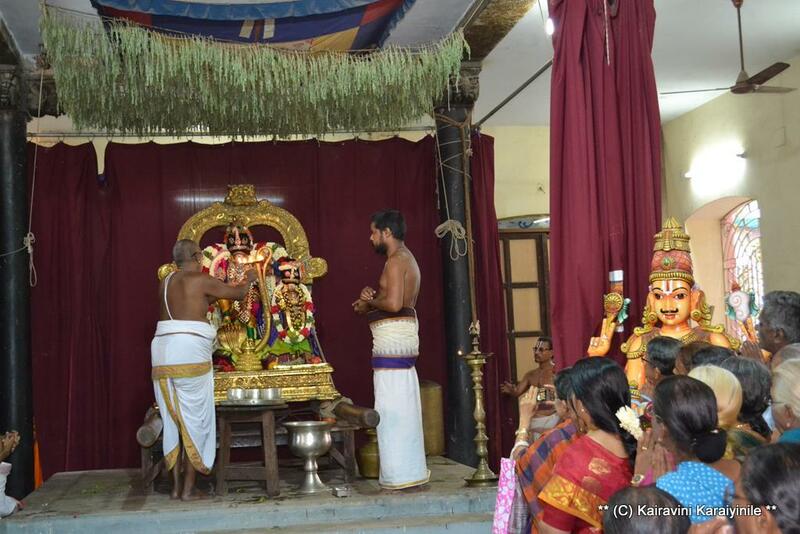 எம்பெருமானுடைய திருமேனியை உகப்பது போலே, அவனது திருவடித்தாமரைகளையும் உகப்பர் பெரியோர். பேயாழ்வாரின் அமுத வரிகளிலே : முன்பு உலகங்களை அளந்த பெருமானுடைய திருவடிகளின் நிறம், அன்றலர்ந்த தாமரைப்போலே சிவந்திராநின்றது; திருமேனியின் நிறம் - பூமியைச் சூழ்ந்த கடல் நீரின் வண்ணம் போல் கறுத்துக் குளிர்திராநின்றது. ; அவன் அணிந்த கிரீடத்தினுடைய நிறம் - ஒற்றைச்சக்கரமுடைய தேரிலேறின ஸூர்யனுடைய நிறம் போன்றது, அப்பெருமானுடைய தேஜஸ் அந்த ஸூர்யப்ரகாசம் போன்றதேயன்றோ ~ என பொன்னிவர் மேனி மரகதப்பெருமானின் விசேஷனாதிகளை சிலாகிக்கின்றார். 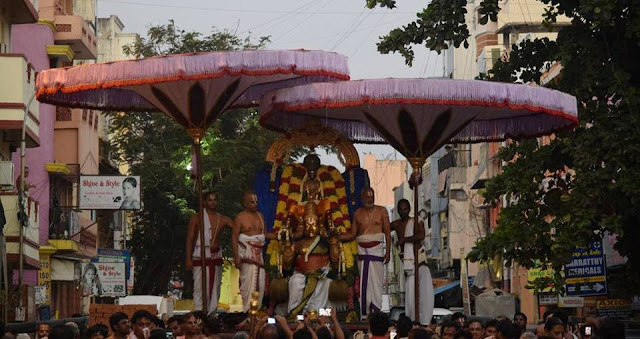 Thiruvallikkeni is replete with Festivities – After the Theppothsavam, starts Thavana Uthsavam … when Sri Parthasarathi has purappadu to ‘Thavana Uthsava Bungalow’ deriving its name from the Thavana Uthsavam that occurs for 5 days starting Masi Krithikai. With the onset of summer, Perumal takes rest under the roof made of dhavanam (Tamil: தவனம்) [Artemisia pallens] – an aromatic herb. 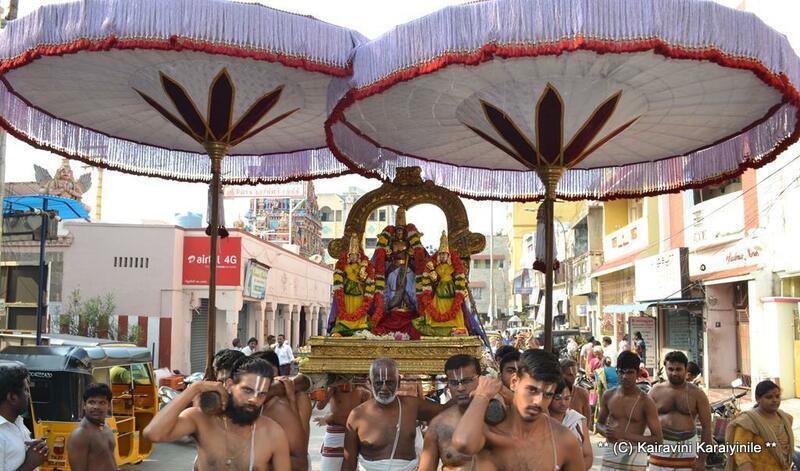 After the uthsavam for Sri Parthasarathi, now it is 3 day Thavana uthsavam for Sri Azhagiya Singar, commencing today 16th Mar 2017..
For us Vedas, and Ithihasapuranams are the most reverred scriptures – Of the two, Mahabaratham is replete with rich moral stories and life instances. It extols the living of Lord Krishna at every stage of his life – right from his birth in prison cell, to moving across river Yamuna during the heavy downpour; to his growth of every stage at Gokulam, his plays at Vrindavan to the Great battle at Gurukshetra and more………. Some of them are : “the lifting and holding the Govardhana Giri to protect the stony rain; His bathing exploits with Gopikas; throwing away the Asura who came in the form of a calf and with that making wood apples fall; dancing on the hood of the deadly Kalinga and more”…….. !! Kaliya also known as Kalingan was a poisonous Naga living in the Yamuna River, in Vrindavan where occurred the legend of most dreaded Kaliya and the exploit of Lord Krishna who jumped into the pond, danced on the hood of deadly snake, thereby turning the lake turbid - and when Kaliya surrendered, He benevolently favoured him too…. 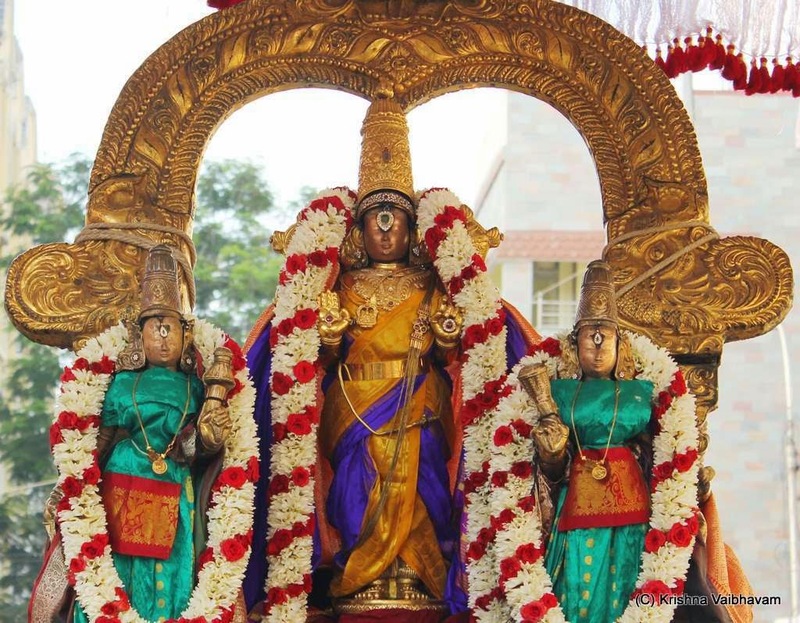 Sri Thelliya Singar had purappadu in the morning reached the Bungalow, had Thirumanjanam inside the premises, had purappadu inside the Bungalow in the evening. He had sarrupadi [decoration ~ alankaram] as ‘Kalinga Narthana Kannan ~ the Krishna who danced on the hood of Kalinga, the snake during Krishna Avathara’. 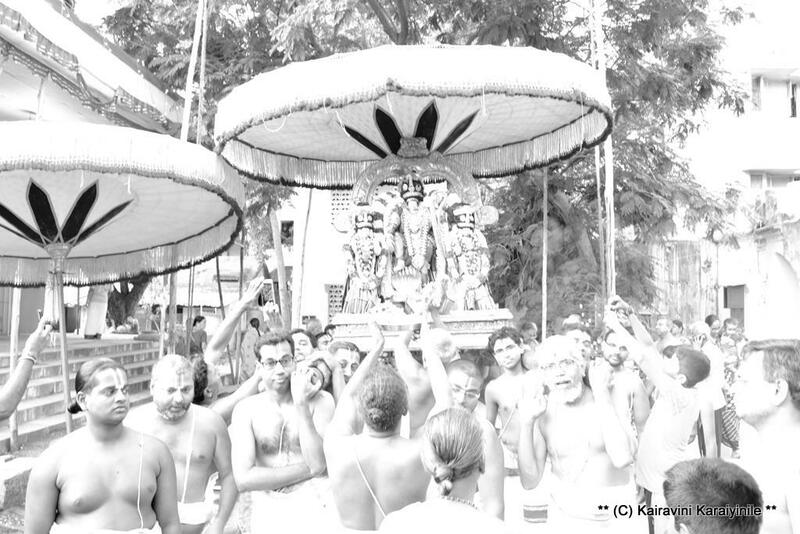 To make you appreciate the sarrupadi, a photo of Azhagiha Singar taken during Swathi purappadu on an earlier occasion is also posted here. By chance occasioned to read a book titled ‘Cyclonic storms in the Bay of Bengal’ – for the use of Sailors by John Eliot. .. .. ..
Bay of Bengal, the largest bay in the world, forms the northeastern part of the Indian Ocean. Roughly triangular, it is bordered mostly by India and Sri Lanka, Bangladesh, Myanmar (Burma) and the Andaman and Nicobar Islands to the east. Number of rivers flow into it and that includes the holy Ganges, the Brahmaputra, Godavari, Mahanadi, Krishna and Cauvery. Alongside the bay of Bengal is the famed sandy Marina beach, running from Fort St George to Besant Nagar. To the early morning visitor, Marine offers tranquillity and more. Do you love the sea, the shore, the waves, the boats and more ! or does it raise an eerie fear in you. You would read something extracted from the book, though the purpose of the post is the blissful happenings on 12th Mar 2017 ~ Masi Magam, a special one. At 0530 in the morning Sri Parthasarathi adorning beautiful ornaments had purappadu atop Garuda Vahanam and reached Bay of Bengal for theerthavari. 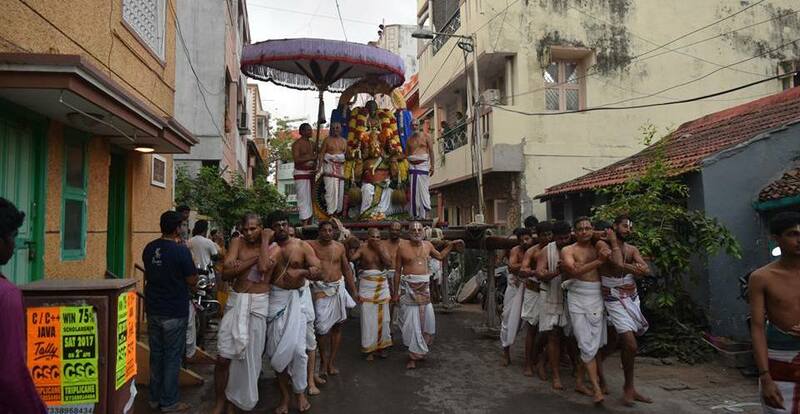 This is an annual Uthsavam and thousands accompany Him, have purificatory bath after Chakrathazhwar theerthavari. கடற்கரையில் வெள்ளை அலைகள்வந்து உதைக்க சிவப்பான பவளம், வெண்மையான முத்துக்கள், அந்தி நேரத்தில் அழகான மங்கள விளக்குகள் என விளங்கும் திருவல்லிக்கேணி! 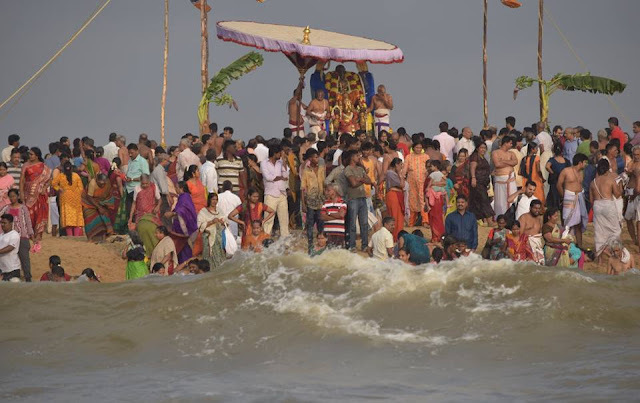 Bay of Bengal on Pournami day would have high ebbs and it would be jumping with joy celebrating the arrival of Sri Krishna, the charioteer to Arjuna atop Garuda vahana. The object of the little volume according to the author is to give the mariner who navigates in Bay of Bengal, an account of the dangerous storms that occur in it and explain the signs and indications by which he may recognize when he is approaching a cyclone ! it is hardly necessary to remind sailors that storms which are met with in Bay of Bengal are occasionally of excessive violence. Formerly when little or nothing was known of the laws of storms, they caused frequent grave destruction to shipping. Brief accounts of atleast two storms that occurred in Bay of Bengal in 1700s are described in detail in Orme’s History of India. 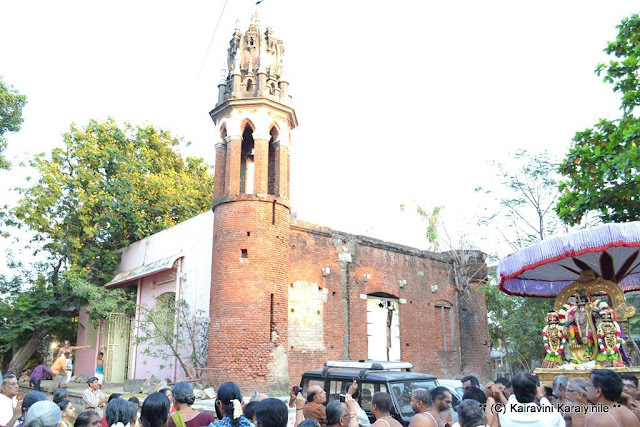 On 2nd Oct 1746 [that was no Gandhi Jayanthi for obvious reasons !!] the weather at Madras was remarkably fine and moderate all day. About midnight a furious storm arose and continued with great violence until the noon of next day causing havoc and killing people. It is hardly too much to say that the knowledge of laws of storms which is due to the labours of meteorologists utilisings the observations furnished by thousands if seamen, is now sufficient, if properly employed to enable sailors avoid the full strength of cyclonic storms in the open sea of the Bay of Bengal. Disasters still occasionally do happen, may be traced to neglect of the most ordinary precautions or to disregard of the accumulated experiences of the past. During a cyclonic storm in Arabian sea and Gulf of Aden in May 1885, the Augusta German man-of- war, the Renard French man-of-war, and the SS Speke Hall foundered at sea within a few hours of each other. If such disasters are not enough, there are strong currents too. The cyclonic winds by friction with surface water may give rise to strong currents in the Bay of Bengal. In the open sea, the currents over the whole storm area of fierce and hurricane winds approximately agree in direction with the winds, and are probably stronger than are generally imagined. 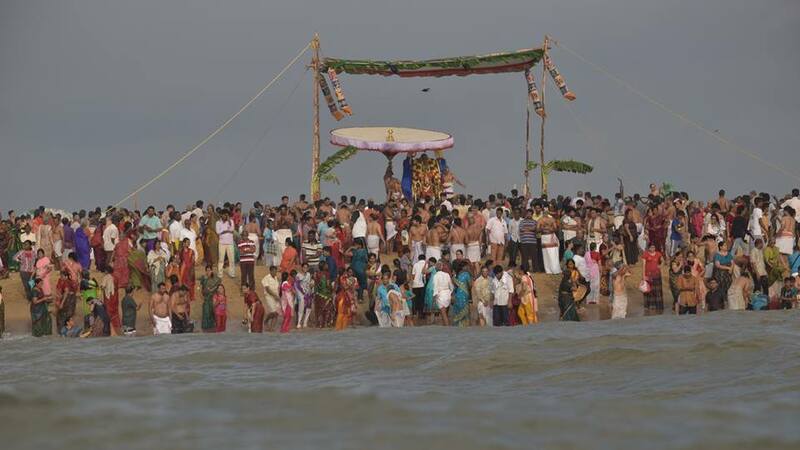 Every year, the lensers of Thiruvallikkeni provide glimpses of Lord visiting the seashore. 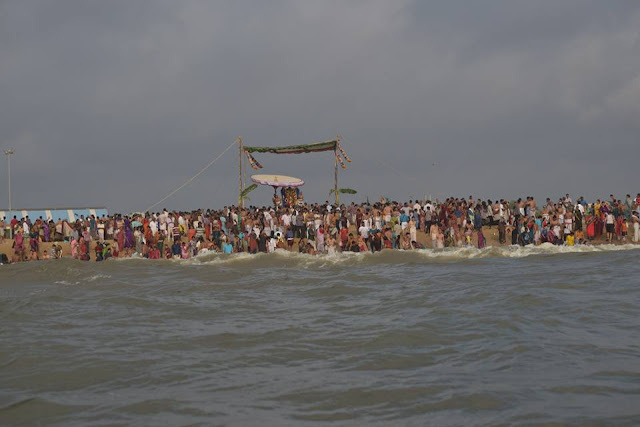 This time the bravest among the group of Srivaishnavaites chose to travel in a boat into the sea and deliver us some beautiful pictures of Lord Parthasarathi at the Bay of Bengal on Masi Magam day – a different view of the crowd as seen from the sea. 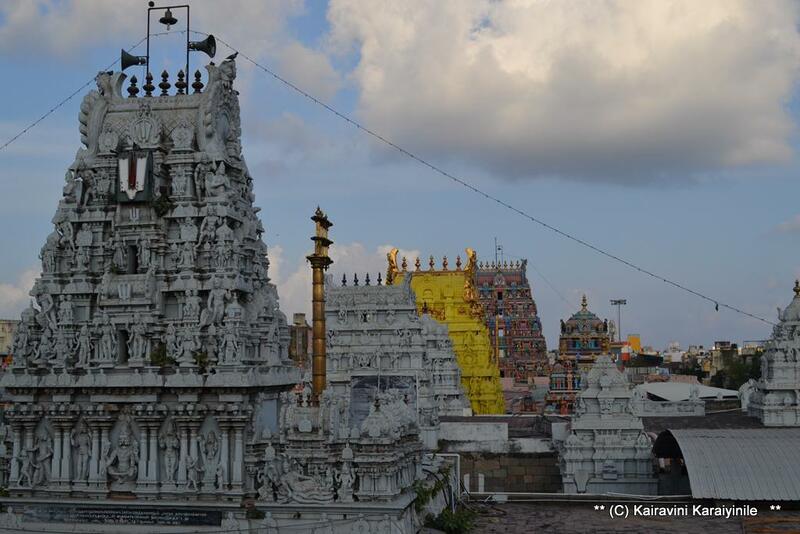 I was away in Tirumala having darshan of Lord Srinivasa and here are some photos taken by my friend Thirumalai Vinjamoor Venkatesh (popularly Jilla) Swamin. Reproduced with his permission and shared. Though boats appear poetry in motion in high seas, it is often difficult and could have : Heaves, the linear vertical motion excess of which can swamp a boat; Sway; Surge; Pitch; Roll and Yaw – all causing discomfort. The book printed in 1890 however adds that – cyclonic storms very rarely occur in Bay of Bengal during the months of Jan, Feb & March. During 15th June to 15th Sept, cyclonic storms are of frequent occurrence, but are not very extensive or violent. 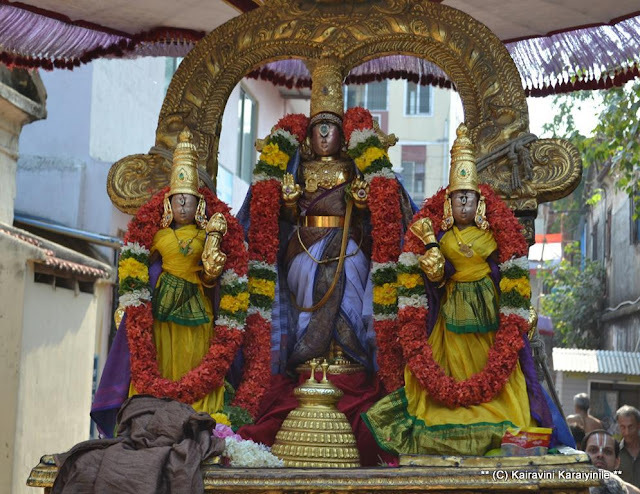 Today 7th Mar 2017 is day 4 of Thavana Uthsavam - Sri Parthasarathi perumal adorned Pandian Kondai and had Sengol [the kireedam known as Pandian kondai as it replicates the one worn by Lord NamPerumal rendered to him by a Pandian King known as Sundara Pandian and the scepter worthy of an Emperor]. 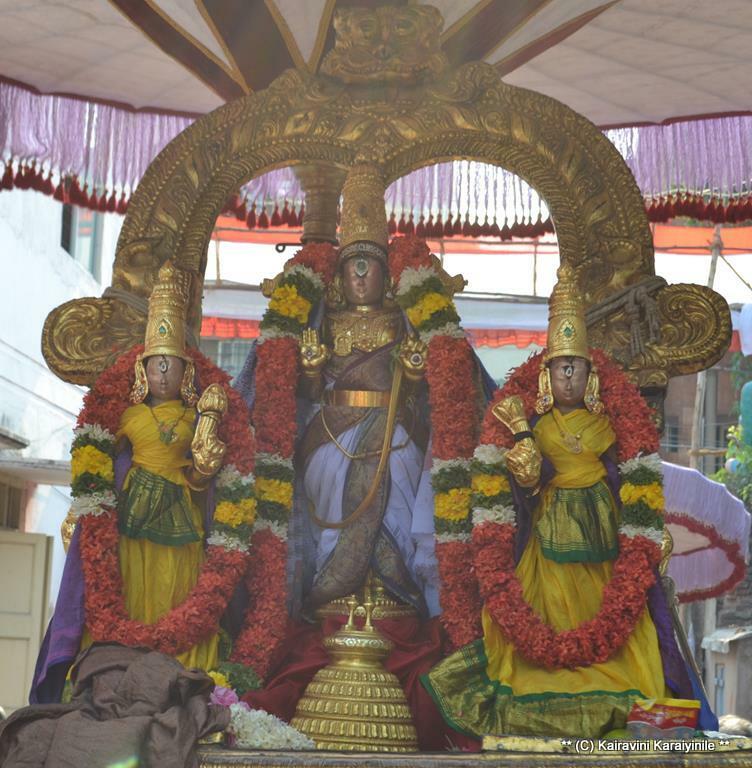 It was Thiruvathirai too and hence double treat – after the veethi purappadu [Nanmukhan thiruvanthathi] – inside it was Ramanuja Noorranthathi for Sri Udayavar. Some basic Q on what sounds sweet to the ears ? – where do human beings rest ? – and does one feel like writing or singing poetry ? 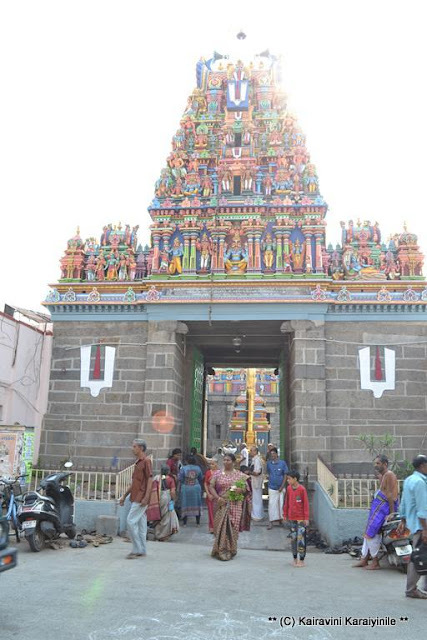 – who would deserve it best - our Thirumazhisaippiran has these simple answers. 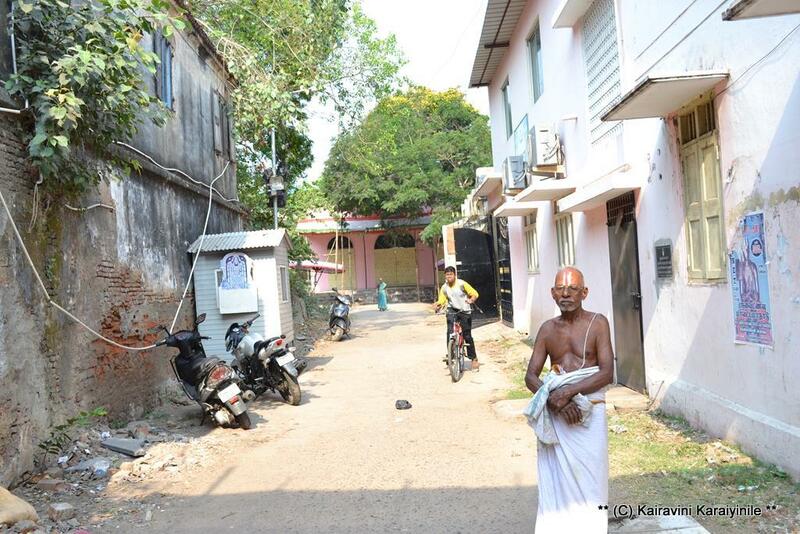 திருவல்லிக்கேணி ஸ்ரீ பார்த்தசாரதி தவன உத்சவத்தில் நான்காம் நாளான இன்று, எம்பெருமானுக்கு விசேஷமாக பாண்டியன் கொண்டையும், செங்கோலும் சாற்றின அற்புத திருகோலம். 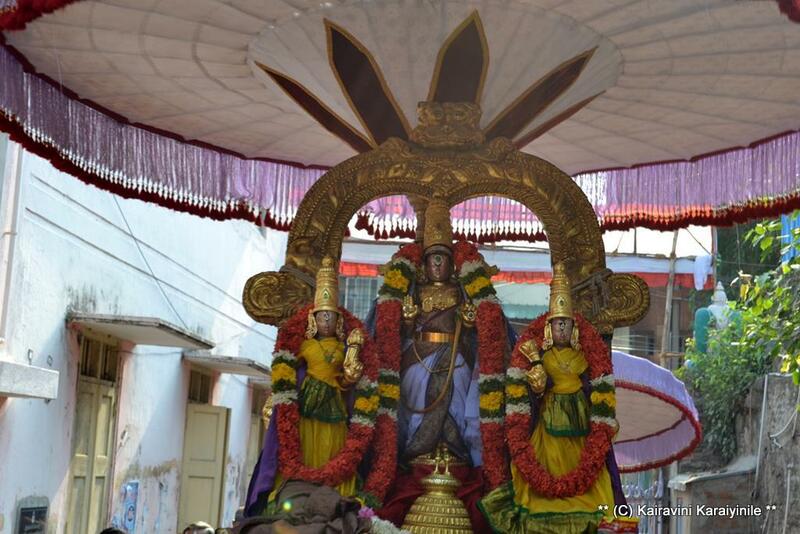 பெரிய மாட வீதி புறப்பாட்டில் நான்முகன் திருவந்தாதி சேவாகாலம். 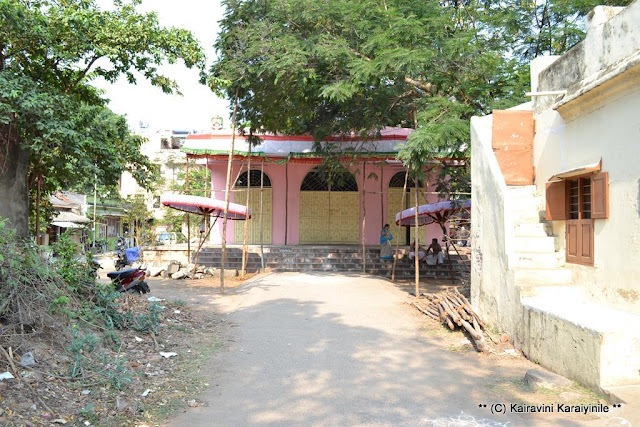 இன்று திருவாதிரையானதால் - கோவில் உள்ளே மணிமண்டபத்தில், உடையவர் வீற்றிருக்க இராமானுச நூற்றந்தாதி சேவை. பேரரசர்களுக்கான செங்கோலுடன் பாண்டியன் கொண்டை அணிந்த அற்புத திருக்கோலத்தில் நம் பார்த்தசாரதி பெருமாளைக் கண்டால் கவி பாட விழையலாம் ! எம்பெருமானைத் தவிர்த்து மற்றையோரைச் கவிபாட நினைத்தால் சொற்களையும் பொருள்களையும் ஏற்றி குறைக்கவேண்டும். எம்பெருமான் (மட்டுமே) கவிக்கு நிறைந்த பொருளாயிருப்பன். எவ்வளவு அழகாக விளக்கினாலும், அவ்வார்த்தைகள் இன்னமும் அதிகம் தகுமே ! 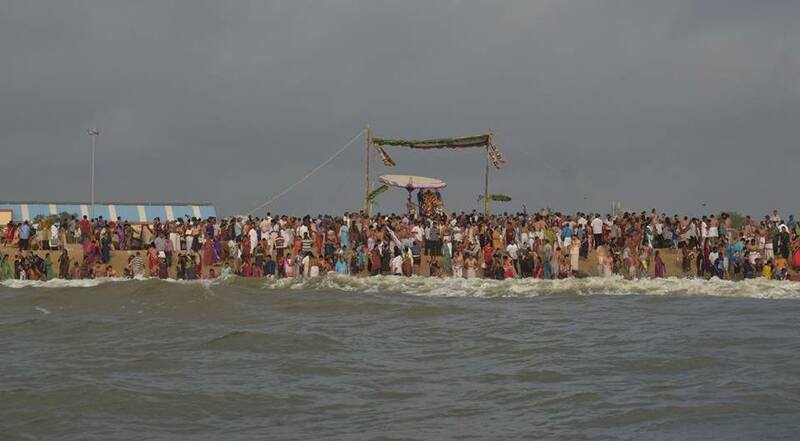 என்பதாகவே இருக்கும். திருமழிசைப்பிரான் எளிய வரிகளில் எம்பெருமான் பெருமையை நமக்கு அளிக்கிறார்.